his particular day’s section is one of the longest of the Via Vigilius. 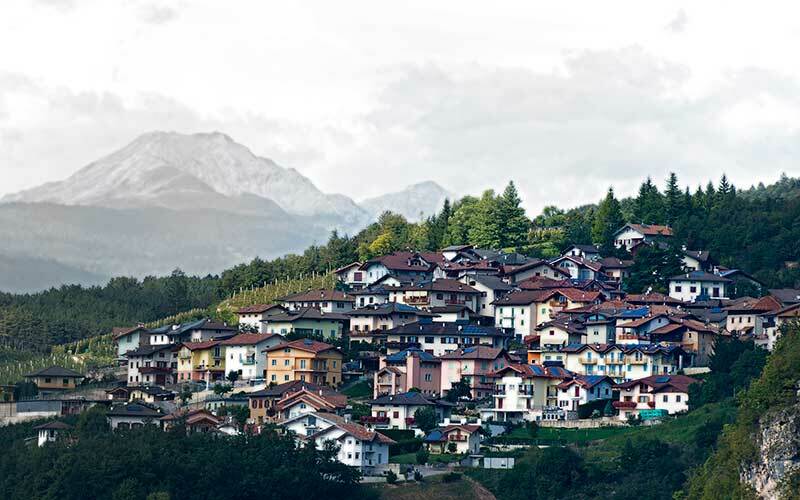 An early start is called for, not only because it is a long stretch, but also because the village of Vervò is perfectly suited for a lunch break. In the vicinity of the church there is a restaurant which is ideal for a stop. The day starts with a relatively leisurely descent. From Sfruz the hike leads down to the creek Rivo delle Sette Fontane, past an old limekiln and along the forestry road in the direction of the village of Tres. The village is only touched at the outskirts; the way leads up to the village of Vervò, where the trail sweeps through open country. The landscape is strongly reminiscent of Tuscany. From Vervò there is a brief hike uphill, following the road leading to the view point named Verginaz. An imposing and impressive canyon cascades down to the river Rio Pongaiola, which only carries water after an extended period of rain or an intense summer storm. On the other side it is necessary to navigate a couple of concrete paved steep sections. This is a somewhat painful undertaking but results in bringing the hiker to the lower edge of the mountain meadows of the alp Malga Vervò. A long section of forestry road leads in a constant up-and-down to the valley Val Marzana. Pass the turnoff to Prà d’Arzia in order to arrive at a fork just above Castel Thun. 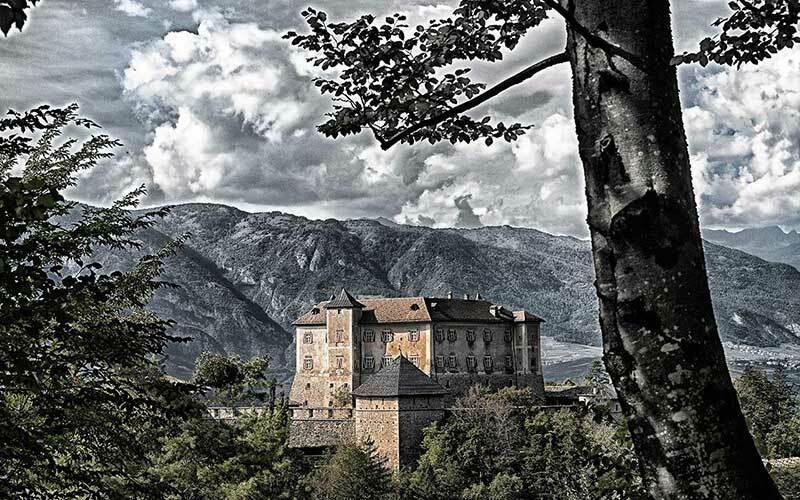 The castle is situated in a magnificent place and right above the building the view opens toward the Brentagroup, the Val di Sole and the high mountains above. Hiking through a mellow landscape fringed by orchards brings the day to a close, at the village of Vigo di Ton. From the church in Sfruz (964 m – sign “Smarano”) briefly hike back in the direction of Samarano, passing a small chapel and turning left at the crossing (big concrete cross – sign Sentèr dei Plazi trail marker 6). The trail descends through the orchards to a left corner, where it meets with another trail. There a small forestry trail branches off (sign “Tres, Vervò – trail marker SF). Descend into the riverbed along the forestry trail and hike on a broad forestry road (sign “Tres, Vervò – trail marker SF) to the reservoir at the outskirts of the village. In the direction of Tres (848 m). Just before the main road to Vervò (there is a small park on the right side), turn left on to the Via Brociai (street sign on the left – otherwise bad signage) and hike up to the caravan parking area. There will once again be red – white markers (SF). Walk uphill at the edge of the parking area and beside the road to Vervò until in a right corner the trail intersects the main road. Follow the signs to Sores (trail marker SF) and ascend through the forest to a forestry road. Cross the road (bad signage) and walk a short stretch uphill through the forest to a concrete paved road. Follow the paved road to a fork with signs. The trail to Vervò branches off to the right (sign “Vervò” – trail marker SF) and leads through meadows to the outskirts of the village, and then to the church in the village of Vervò (910 m). At the church turn left (sign “Vigo di Ton” – trail marker SF) and follow the access road to Predaia up to the first left corner. The way to Vigo di Ton (straight ahead along the gravel road) is indicated by signs and the trail marker SF. The forestry road passes the view point Verginaz (936 m) and the trail gradually descends into the impressive canyon of the seldom water-bearing creek Rio Pongaiola. After crossing the bridge, hike uphill along concrete covered, steep sections. The trail then meanders along the edge of the alpine meadows of the alp Malga Vervò and disappears once more in the forest. There is no trouble with orientation and hiking through the forest to descend into the Val Marzana. Keep on hiking to the forestry road 510 (Prà d’Arza). Walk straight ahead to a crossing to a water cistern in the vicinity of Castel Thun (631 m). The way to the village of Vigo di Ton (signs) branches off to the left. In order to take the short detour via Castel Thun, keep on hiking straight ahead to the castle. Otherwise, pass the castle on the left side to arrive at a parking area, and follow the narrow road downhill to a fork, where on the left the connecting trail (sign “Vigo di Ton”) to the village starts. Terrain: 3.9 km asphalt and 14.7 km forest- and meadow trails, path, forestry road.